Do you remember that book series that was so popular in the ’80’s? Flowers in the Attic. 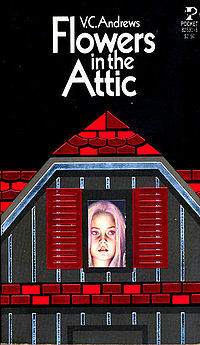 The story of Cathy and Chris, two teen-aged siblings forced to live in hiding in the attic of their grandparents’ as their mom and grandmother hide them from their evil grandfather. The first book came out in 1979 and was written by V.C. Andrews and I remember reading it when I was around fourteen and fifteen years old. It was a whole series of twists and turns, lies and love and tar in Cathy’s hair. I’ve always remembered the tar. The movie came out in 1987 and I remember not being able to wait to see it. Only to be disappointed, of course…the movie is never as good as the book. Why am I reminiscing this afternoon – – because my attic is so clean right now, that I could easily house two teenagers and their twin siblings. I have an organized attic! How is it going on your word of the month? Recall – this month’s word – ORGANIZE. I’m wondering how it is going for you? Two weekends ago I started organizing my attic. I pulled everything out, sorted through things I didn’t want or need or use anymore. Then I put everything back in order of “to store and keep” “luggage and other things I need a few times a year” and “seasonal”. It feels so good!!! Or course the rest of my house is still a mess as I sort through more stuff and get it ready for Craig’s List or sending it off to the Good Will. Looks like my attic threw up in my living room. Geez that’s a lot of stuff! I hope you’re working on three projects that need organizing. They don’t have to be as huge as an attic clean out. Maybe you have a junk drawer that needs some organizing. Maybe your bathroom closet could use some help – throw away all those expired medications once and for all. Or maybe you’ll tackle your filing system like I plan on doing for my next goal. Quick! – list one thing in the comments below that could use some organizing in your home or office. What would it take for you to get started on it this afternoon? Categories: Getting Organized, Word of the month | Tags: DIY, flowers in the attic, get organized, home, word of the month | Permalink. A number of years ago, I called my mom to ask her for a recipe for her famous Sausage and Bean Soup. She didn’t give it to me right then – we decided that I could get it the next time we talked. We continued on our conversation for about ten more minutes and then it was time to go. About a minute and a half after we hung up – – my phone rang again. My mom is a really good cook. I even dedicated my eBook to her. She made a home-cooked meal almost every night that we were growing up. She also has quite the recipe collection. Yet, it was no surprise when she called back so quickly and had the recipe ready for me to transcribe. You see, my mom is also quite organized. I’ll spare you how we had to maintain our sock drawers while we were growing up. My question to you is – how long would it take you to find a recipe? Or the manual to the garage door opener? Or your tax paperwork from 2003? Or your sunglasses? This month our Word of the Month is – Organize. So let’s do just that. I challenge you to pick three things that you have been wanting to and meaning to get organized over the last weeks, months, years – – and get them done! It is still the very beginning of the month and you have plenty of time to accomplish this! Well – five seemed like too much and three was the last number of the year (13). b. it is too big to do in one day. Three seems like an achievable number of projects to complete in the month. I would encourage you to find projects that need to be done (don’t pick something you routinely do like put laundry away), identify the supplies you’ll need and set some time aside either daily, every other day or weekly. But schedule it in. That part is important. It is because you haven’t made time for it in the past, that you haven’t gotten it done today. Go – block off some time on your calendar right now. Now – I invite you to share with everyone in the comments below or on my Facebook page. What are you going to tackle? I can’t wait to hear what’ s on everyone’s agendas. Categories: Getting Organized, Word of the month | Tags: eBook, get organized, staying organized | Permalink. I stumbled across an interesting concept a few weeks ago while I was surfing the web. Instead of a New Year’s Resolution, you pick one word to focus and inspire you throughout the entire year. Have you heard of this before? A couple of websites where I learned more about this idea are My One Word and One Word 365. I can’t do a “one word” challenge for a year – clearly that would plagiarizing since it is already being done. To be really honest, I’m not sure I could come up with just one word that I could revolve my entire year around…that sounds like a lot of pressure; what if I pick the wrong word? And since we’re being honest, I think in my attention span wouldn’t last with an entire year with just one word. I’d be lucky to make it to March. Do you recall last week when I wrote about enough talk – let’s start doing? Here’s what I propose. My vision for this challenge is to offer my ideas, my personal progress, and suggestions on how to accomplish our word. But I’d also love to hear how people are grasping their one word for the month. Share your story, ask some questions, encourage with your ideas. Let’s start a conversation and see where this takes us. I’m inspired by these ideas of focus – let’s get focused in 2013! OH – – you want to know what the word of the month is for February? – – Organize ….I’ll explain more tomorrow…. Categories: Getting Organized, Word of the month | Tags: get organized, my one word, one word, one word 365, word of the month | Permalink. WOW! Hard to believe that the summer is almost over. Soon, my blog hiatus will be coming to an end too. I’ll be back at the beginning of September bringing you daily time-saving tips. This tip written in August of 2010 is still a great idea for taking the hassle out of the I don’t know what to wear blues. This tip written last year helps with back to school clothes shopping. This experience doesn’t have to be a bad one. The final tip written in 2011 helps get your calendar organized. Hope you and your kids have a wonderful and successful school year. Categories: Getting Organized, Money-savers, Time-savers | Tags: back to school, back to school shopping, clothes shopping, school calendar, school clothes, school year, successful school, time saving tips | Permalink. Don’t you love receiving a birthday card? I do! I love seeing all the cards displayed across our mantle and I keep them up there for a couple of weeks until I take them down and tuck them away. 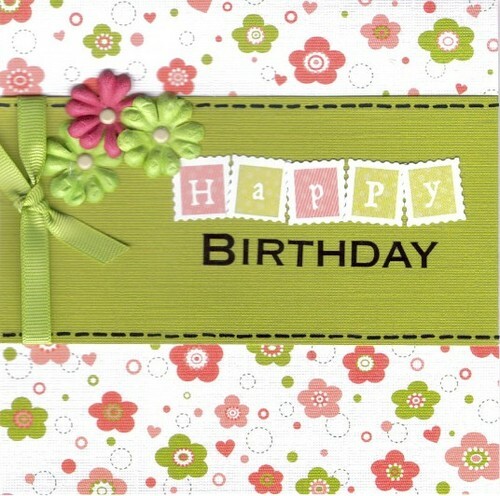 I think the art of sending birthday cards has fallen by the wayside with technology and hectic schedules. But if you love receiving cards, I’m sure people would love to receive one from you. And it is really quite easy to do. And it takes just a little bit of planning. Use the first day of each month as your jumping off point. On this day, sign, seal, address each card you wanting to send out. Write the date in the spot where the stamp will go. When the time gets close, place a stamp over the date and stick it in the mail. If you prefer to send eCards, many of these have a time set option where you can put the exact date of delivery. Then plan ahead for next month. Make a list of whose birthdays are coming up and stock up on cards. Then you’ll be ready for next month. Over time this will become your habit and you’ll feel good about remembering your friend’s special days. Categories: Getting Organized, Tips on Tuesdays | Tags: birthday cards, ecards, happy tuesday, hectic schedules, mail, post office, set option | Permalink.